Affiliate Links: If you click on a link I may make a very small commission. You may recognize this cardigan already if you keep up with my Stitch Fix adventures, as it was a keep from my last Fix. These cardigan outfit photos are actually a little bit old… it’s kind of nice to have “back ups” for a rainy day. Even if today wasn’t really a rainy day at all, I just figured I’d better post this outfit before it gets too warm for this to look completely ridiculous. Granted it rarely is that warm in Seattle, but still. I’ve heard the socks and hairdryer tip via pinterest…. but that’s all I got!! Thanks Becca! I’ll have to try that before I wear them next! Love the cardigan! It’s so bright and I love the fringe detail! Great outfit. Love those sandals. I always find the cutest stuff at Target. They are really on point with their style now! Thanks Christina! Agreed, I’ve found some great pieces this spring at Target! Ooooh, I love that cardigan! I’m very into ballet / soft pinks right now, its such a delicate and beautiful color! Thanks Shannon! I love blush tones right now too! That cardi with those shoes =perfection. I love the boho feel! Cute look! I love the color of that cardigan, it’s perfect for spring! Love the cardi! Especially digging that color! Love the color of the cardigan; it’s light and summery without being too “in your face.” Super cute, lady! Ouch!! I’ve unfortunately made the mistake of wearing brand new shoes on days that I was going to be walking a lot too….actually too many times! If it makes you feel any better, those shoes are REALLY cute! lol Love that color cardigan on you, super pretty! Thanks Julie! That’s pretty much why I wanted to wear them, beauty is pain I guess! This cardigan is so cute! I love fringe clutches or purses or on cardigans like yours! Oh, that cardigan is ADORABLE! And I love your heels!! Absolutely love this cardigan! Great look altogether! I love the cut of this! absolutely perfect! So cute!! I have shoes just like that! And they’re so cute but they really do hurt my feet as well. Pain is beauty, right?! Haha, yep it totally is! Thanks Rachael! That color is so pretty! I’m a fan of pretty much anything with fringe. Thanks Chelsea, I thought so too! I absolutely love this cardigan! 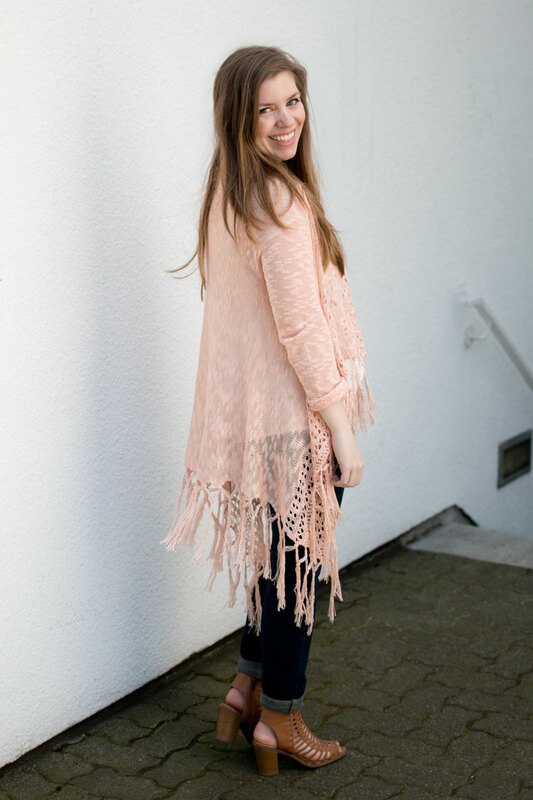 Your cardigan is so pretty and fun, Jenn, and the colour is perfect for Spring. I also love the sandals. Last fall I saw a similar brown-ih cardigan but the price was a little too much for me.